John, Migs, and Alex sit around a pot of serious sauce and discuss every comic fan’s nightmare: Balancing your Fandom with your Finance. The boys discuss their common purchasing practices and the logic that goes behind their choices. John, Alex, and Migs team up to bring you the fourth installment of TK’s Top 100 Comics! Enjoy! TK Special: 2011 Movies Prejudged! John and Migs are joined by Jad as they discuss expectations and qualms about 2011’s upcoming comic book movies. Thor, Green Lantern, Captain America, and X-Men First Class are all packed into this hour of talk. 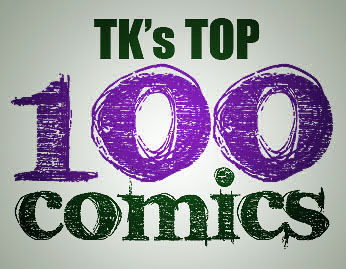 Join us again in a few days for a continuation of TK’s Top 100 Comics.